Its one of those metals that has an indelible aura about it and its presence is intricately woven throughout our lives, both ashore and afloat. However, it is imbued with an inherent weakness that can put your vessels watertight integrity at risk. Brass is an alloy of copper, and copper has been a boatbuilding material for centuries. Its most notable place was in copper cladding hull bottoms to prevent teredo worms from digesting the timbers, as well as being a natural antifoulant. In fact, in one form or another, copper is the antifouling additive in many bottom paints. It is an excellent biocide and in addition to bottom paint, its primary use is in domestic water systems on todays cruising boats. Beyond its ability to inhibit biological growth, a worthy attribute in a freshwater system, it is opaque. This robs plant-based biological growth of one of the necessary ingredients of lifelight. Copper tube is also used by some engine manufacturers to carry raw water to and from cooling pumps. This usually works well, although the tubing is often of proprietary alloys and shapes, which means it can be difficult to source and is expensive. Additionally, it is susceptible to two forms of corrosion that are likely to be seen aboard a cruising vessel. Impingement attack or erosion corrosion is caused by swiftly moving water in a copper pipe or tube. Since copper is relatively soft, it can literally be worn away by swiftly moving water, especially sea water. This is especially true at 90-degree turns and restrictions where turbulence and velocity are greater. Copper can also fall prey to decay by exposure to hydrogen sulfide, a common constituent of polluted water. Brass, a metal that is almost synonymous with the sea, is actually a family of copper alloys whose primary ingredients, in varying ratios, are copper and zinc. In fact, some brasses are comprised of as much as 50 percent zinc. Some of the more common "seagoing" brasses are red brass: 85 percent copper, 15 percent zinc; cartridge brass: 70 percent copper, 30 percent zinc; Muntz metal: 60 percent copper, 40 percent zinc; admiralty brass: 70 percent copper, 30 percent zinc; naval brass: 60 percent copper, 40 percent zinc; aluminum brass: 76 percent copper, 22 percent zinc, 2 percent aluminum; and finally, manganese "bronze": 60 percent copper, 40 percent zinc. Because of its zinc content, manganese bronze is actually not bronze at all; it resides squarely in the brass family. While brass has many familiar uses aboard, from clocks and joinerwork trim to lamps and electrical components, it should never be used below the waterline or in raw-water applications. It is worth noting that many small (1/43/8-inch NPT) plumbing fittings, such as pipe-to-hose adaptors, pipe plugs, and bushings are made of brass while their larger cousins are bronze. Most seacock and sea strainer drains utilize 1/8-inch NPT plugs. Under no circumstances should these be replaced with brass. Bronze plugs of 1/8-inch can often be obtained from the equipment manufacturer. If unsure of the plug material, avoid using it below the waterline or in raw-water applications. 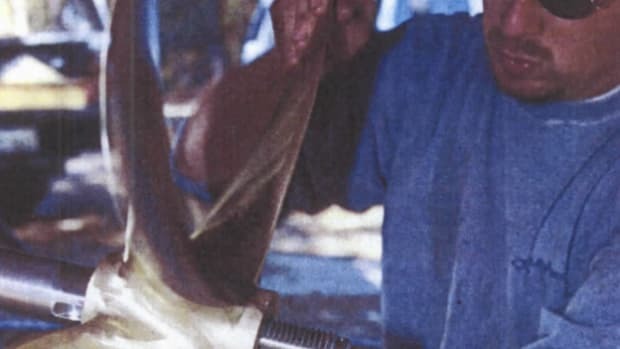 In my experience, chandlery clerks and many marine equipment vendors cannot be relied upon to provide accurate alloy information, as many are unaware of the important distinction between brass and bronze and related prohibitions for use of the former in raw-water applications. Another location where brass is often inadvertently used involves water injection ports on stuffing boxes. These often call for a threaded pipe-to-hose adaptor of the 1/4- or 3/8-inch variety. Rest assured, and Ive seen the results personally; making an error of this sort can have dire consequences. If its primary constituent is copper, why is brass so susceptible to corrosion? Because many of the brasses also contain a substantial amount of zinc, they are especially susceptible to a type of corrosion referred to as "dezincification." This is a process whereby the zinc selectively corrodes leaving a porous copper shell that retains its shape but little of its strength. A dezincified brass propeller can be identified by its splotchy reddish or pink coloring. Contrary to popular belief, many propellers are fabricated from a brass alloy (by definition, in order to be considered a true bronze, a copper alloy must contain little or no zinc) and, as such, are especially susceptible to dezincification. To protect this often-substantial investment, it is imperative that sacrificial zinc anodes be monitored and renewed when necessary. In a stainless steel/Aquamet shaft, brass propeller combination, once the zinc is gone the next least-noble metal (or metal most likely to corrode) is the brass prop. It will begin to corrode, sacrificing itself for the shaft, which is nobler. Brasses are susceptible to other forms of corrosion in addition to dezincification. Ammonia, a common ingredient of household cleaners, will readily attack brass, causing it to weaken and crack. Mercury is also an enemy of brass, as is the aforementioned polluted water. Bronze, although it is a copper alloy, is different from brass in that it is free of any appreciable amount of zinc and is not susceptible to dezincification. Like brass, its parent alloying element is copper, however, thats where the similarity ends. Unlike brass its primary alloying element is tin. As a result, pound for pound it is often more expensive than brass, which contains less costly zinc. Gunmetal, as its name suggests, was used for firearms manufacture in days of old. It is a bronze alloy consisting of 88 percent copper, 10 percent tin, and 2 percent zinc. It is not especially strong, but corrosion resistant and perfectly acceptable for below-the-waterline use. It is often used to fabricate such cast items as cleats, chocks, and shaft logs. Yet another bronze alloy, aluminum bronze, is strong but susceptible to de-aluminification. This can be prevented with the addition of nickel, and this alloy is typically referred to as nibral (nickel, bronze, aluminum). Propellers are often made of this material and with good reasonits strong and corrosion resistant. Manganese is sometimes added to this already mixed soup of metals to further increase strength. Prop repair shops sometimes charge a premium for reworking nibral props due to their tendency to take on a set or memory. This alloy should not be confused with the inferior manganese bronze, which is actually brass. Silicon bronze is by far the most popular alloy for the fabrication of underwater hardware. Most quality seacocks are constructed of this extremely resilient metal. It is made up of 96 percent copper, with the remainder being silicon and other trace elements, sometimes including very small amounts of zinc, often measured in single percentage points. Bronze hardware such as nuts, bolts, and screws are often made of this alloy and can be expected to give long, corrosion-resistant service. Phosphor bronze is typically made up of 8595 percent copper and 510 percent tin, with the addition of a small amount of phosphorous. The phosphorous improves the hardening characteristics of the bronze, making it a choice material for bearings and springs. Above all else, remember that brass is ill-suited for any application where its called upon to convey or stem the flow of raw/sea water, regardless of whether its used above or below the waterline. This includes plumbing associated with raw-water strainers, stuffing boxes, seacocks, sanitation, and air conditioning systems.